Now that Duke is almost (one more day!) two months, I can look at that first month and really see what (or who) got me through it. 1. I tried but I just couldn’t leave him in his crib the first night. I cried and cried looking at his little body ... all alone. So, I put him in the bouncer next to our bed. The next few nights were SO hard, but we did it. We put him in his crib. I couldn't have done it without Colt reassuring me that he really was fine. So, since the second night home, Duke slept in his crib. Each night got easier and I got more and more used to it. Colt and I decided early on that we'd register for a bassinet but if we didn't get one, we'd do without it. I think it was a good choice. I didn't get attached to Duke being so close to me and he was comfortable in his crib early on. 2. We used our monitors when Duke was sleeping for the first several nights. It was a comfort for me to have them on, but I would jump and flinch at every little sound he made. I realized (thanks to my mom) that we could hear the sounds that mattered without the monitors. I mean, here we were in our bed ... Colt had a monitor on his nightstand and I had a monitor on mine. We were within feet of Duke's room. It really was kind of silly. We needed our sleep (what we could get) and with 2 monitors on, it wasn't going to happen. It was a good piece of advice from my mom and I'm glad we took it. 3. Everybody needs somebody. I don't care if it's your husband, mom, sister, aunt, whoever ... but somebody needs to come over and help you during the day. My mom totally saved my life. I needed her more in that month, it feels like, than ever before. 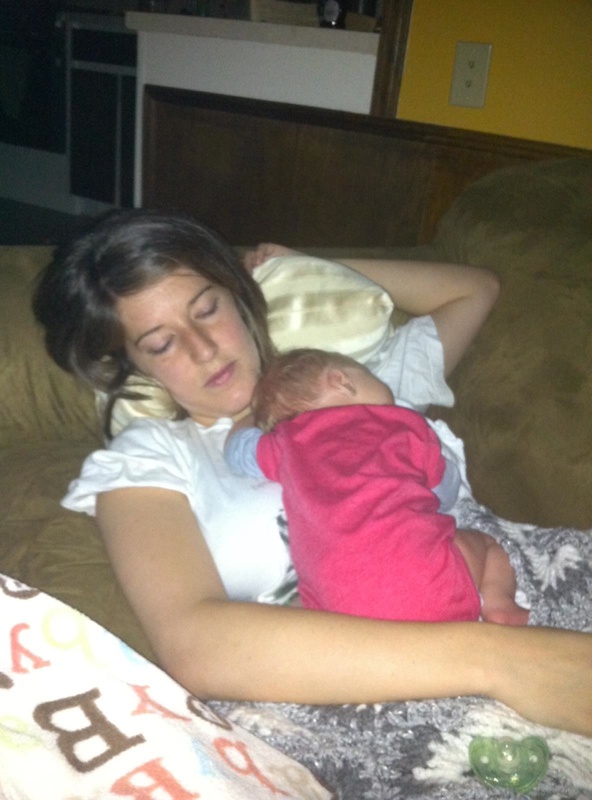 She went to the store for us, brought us meals, held Duke, changed diapers, let me take naps ... and the list goes on. After a nap one morning, I woke up to a clean kitchen, warm blueberry muffins, and a happy baby. I'll never forget it. She is my hero. 4. Starting Babywise was a breath of fresh air. It solved a lot of my "I have no idea what I'm doing" moments. Next time, I'm starting it earlier. The book says to let your baby do whatever for that first week, but you can still begin to establish the cycles of eating/waking/sleeping. 5. I allowed myself to be among civilization. Colt and I had some nights out, thanks to the grandparents; and I had some nights away with some friends, thanks to the husband. So, whether it's a date night or some alone time for you to grab coffee and pretend you're still human, it helps. 6. Sleep when the baby sleeps? I did it as much as I could, but there were some times when I just wanted to be awake doing what I wanted to do. And that's okay. Sure, I could've fit some more naps in during that first month, but doing things around the house kept me sane. 7. We were so blessed to have our meals taken care of for about 3 weeks. It's amazing how just knowing what you're having for dinner each night is a weight off your shoulders. If someone offered to bring lunch, I let them ... although the polite bones in my body wanted to sweetly say, "Oh, no, I'm fine." But the truth was, I wasn't fine! I needed help and I needed food. 8. I couldn't have lived through it without Colt. That month holds a lot of arguments and intense times but it also holds a lot of sweet moments. I realized that I not only married someone who is a great husband but a wonderful father as well. "Surviving" doesn't make it sound fun and not every mom necessarily feels like that's what they're doing the first month ... but I did. It's a month of learning about your baby, yourself, your husband, and your new life.